Hi, Milly Bays here for the Putty of Might, the easy way to fix, fill and seal virtually anything fast and make it last! The Putty of Might isn’t glue or resin from the dimension of sticky things, but an amazing demonic-powered epoxy that you can mold into any shape and apply directly to most any surface for an eternal soulbond! Simply knead to activate, apply, and let dry…which it does in six seconds! Non-dimensional hole raining toads again? With the Putty of Might you can block a one-foot gap with no problem. Watch as we blast a hole in the side of this local fisherman’s ship and immediately repair it! Wowee! Need to connect two objects? No sweat! The Putty of Might can hold over a ton of weight! Watch as we fuse this old man to this ceiling lickety-split! But wait, there’s more! 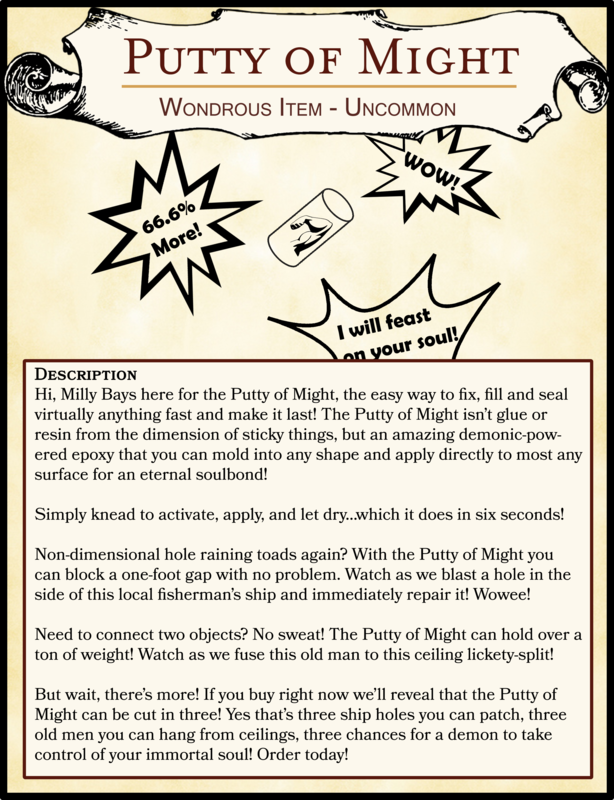 If you buy right now we’ll reveal that the Putty of Might can be cut in three! Yes that’s three ship holes you can patch, three old men you can hang from ceilings, three chances for a demon to take control of your immortal soul! Order today!